What Are the Benefits of Oatmeal for Weight Loss? How Does Brown Rice Differ From Whole Grain Rice? Store-bought or homemade granola is an oat-based cereal that you can have for breakfast or as a healthy snack. Eat it plain, with milk and fruit or in yogurt. Control your portion size and eat granola as part of an overall balanced diet to get the most health benefits. If you need help developing a healthy eating plan, ask a nutritionist. Granola is healthy because it is a whole grain cereal. Oats are whole grains, which means they still have the bran, germ and endosperm components of the entire grain kernel, and you should get at least half of your grains from whole grain sources. Whole grains such as granola might lower your risk for heart disease and type 2 diabetes, according to the 2010 Dietary Guidelines from the U.S. Department of Health and Human Services. 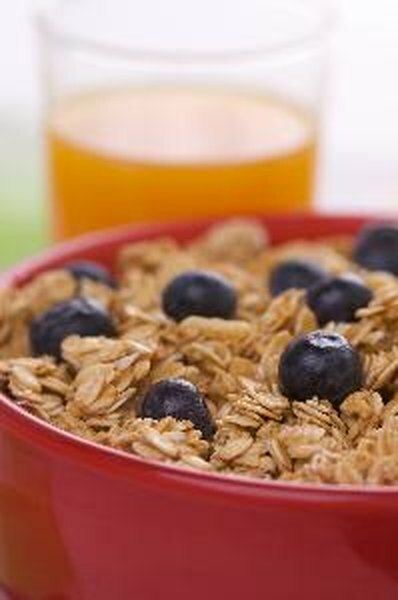 Most Americans do not meet recommendations for whole grains, and granola can help. Granola is healthy because it provides dietary fiber, which comes from plant foods such as fruit, vegetables, beans and whole grains. Dietary fiber lowers your risk for constipation and type 2 diabetes, according to the University of Maryland Medical Center. The fiber in oats lowers your total and bad LDL cholesterol levels. For extra fiber in your granola, purchase a high-fiber brand or increase the fiber when you are making your own by adding nuts, seeds, flaxseed or dried fruit. The oats in granola provide iron and potassium, but almost no sodium. If you purchase granola as a ready-to-eat cold breakfast cereal, choose a variety that is enriched, which means it has thiamin, riboflavin, niacin, folic acid and iron, according to the 2010 Dietary Guidelines from the U.S. Department of Health and Human Services. You might want one that is fortified with other essential vitamins and minerals, such as vitamin D and calcium for bone health, or vitamin E, an antioxidant. Homemade granola can be healthy because you can add nutritious ingredients such as flaxseed or walnuts, which provide heart-healthy omega-3 fatty acids. You can use granola as the whole-grain component of a balanced breakfast, which also should include a serving of a reduced-fat dairy product and some fruit. Your overall diet might be better when you eat a healthy breakfast, and your concentration might be better throughout the morning, as well. Granola can be high in sugars, however, so opt for one that has no more than 13 grams of sugar per serving. Monitor your portion size because granola is often higher in calories per volume than other cereals. How Can Oatmeal Help You to Lose Weight? How Do You Lose Weight Quick With Fruit and Vegetable Diet? Wheat Bran or Oat Bran: Which Is Better?